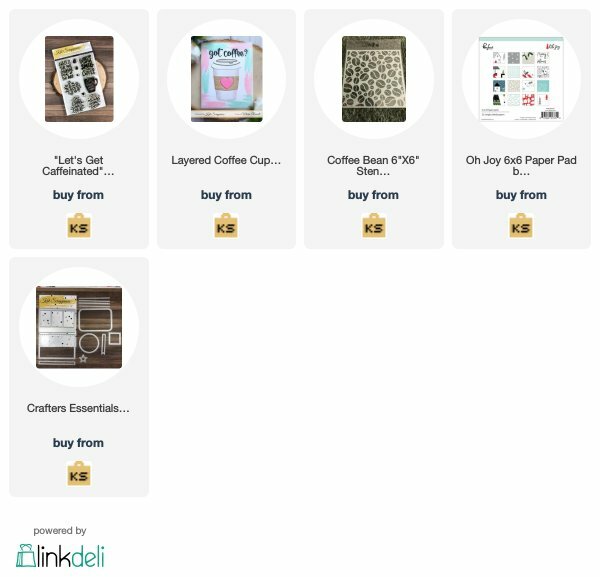 Hi all, welcome to today’s fun blog post where the Kat Scrappiness design team are playing part of the 2018 National Coffee Lovers Blog Hop. Just a reminder that this is a TRADITIONAL Blog Hop. It starts on the Coffee Loving Cardmaker’s blog. Kat Scrappiness will be giving away 2 x $25 Gift Cards over on their blog. All you need to do is leave a comment over on their blog post and each of the Design Team members blog posts and Kat Scrappiness will choose two winners who will each win a $25 gift card to their store. The Coffee Loving Cardmaker’s blog will also do a giveaway. It will run for one week with the winner announced on Monday, October 8th. So here is how I made my card. With the Kat Scrappiness Build a Coffee Cup Die I used white cardstock and paper from Pink Fresh Studio “Oh Joy” pack. I loved the blues and greys in the pack and thought I would use it other than for a Christmas card. I added some twine around the coffee cup and tied a bow and adhered it down with glue dots. The circle stitched die cut is from the Crafters Essentials 1 which I have stamped the sentiment from the new Kat Scrappiness Let’s Get caffeinated Stampset with Catherine Pooler Twilight Ink. Hope you enjoyed today’s card creation and hop along the hop. Please leave me a comment and let me know what you think. This is so SWEET! I love the soft colors and the embossing paste Jo! So beautiful! Love the soft colors and what a great background! Very sweet! Hi friend, this card is lovely!